Last month, we ended our note with an aside on the various alternative policies the Bank of Japan (BoJ) might adopt to offset what was beginning to look like a meaningful deterioration in the economic backdrop. Since then, there has been an interesting debate led by the Ministry of Finance, but also seemingly with support from PM Shinzo Abe, which is beginning to question the BoJ’s 2% inflation target and suggests greater policy flexibility. This inflation target was missed by a mile once again in February, with national inflation coming in at 0.2%YoY, even missing the consensus of 0.3% forecast. Minister Aso made a point that is worth repeating, mainly because it makes real what is otherwise an esoteric discussion between economists about inflation expectations, policy credibility and investment and savings substitution. He said, "For the general public, there isn't a single person out there saying it's outrageous that we haven't reached 2 percent inflation". 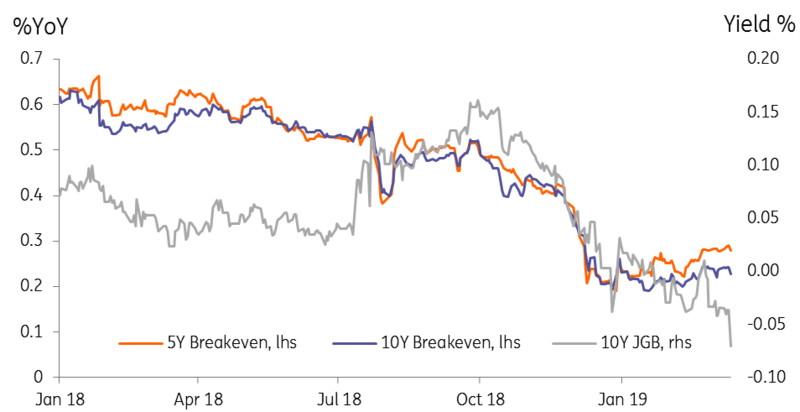 Markets certainly don’t take the BoJ’s target credibly, with 5 and 10Y breakeven measures of inflation expectations of only around 0.2-0.3%. Taro Aso makes a valuable point. For many ordinary households, the price of everyday goods such as food is already high, and some decline would be regarded as no bad thing. We doubt it would spur a death-spiral of deflation concerns. This debate about BoJ policy is still in its infancy. Aso and Abe have since held a press conference in which they have expressed their full support for BoJ Governor Kuroda. But this is probably not the last we have heard on this topic, which raises many sensible questions about ultra-low interest rate policy, the appropriate level of inflation targets, central bank credibility and forward guidance. This is certainly too much to cover here. But for a little aside on one aspect of this debate, you could read a short note we recently wrote on the counterintuitive impacts of ultra-low rate policy on growth and inflation in Japan. The other thing to mention this month is that in the wake of the softness in both growth and inflation, we have decided to remove from our forecast numbers the consumption tax hike that was due to be implemented in October this year. The consumption tax plan was confirmed by PM Abe in October last year, but this wouldn’t be the first time its implementation was postponed. Removing the tax hike removes the artificial boost to inflation that was due to kick-in during 4Q19 and provide four quarters of artificially higher inflation- the only way Governor Kuroda would ever be able to meet the BoJ’s 2% target except via the import channel. The removal of this tax hike from our forecasts also affects our GDP numbers, as these tax increases cause households to front-load expenditure, though with the unfortunate side effect that this also usually generates a subsequent slump in spending – even recession immediately after. We don’t believe the economic backdrop of Japan’s economy will be looking sufficiently robust to withstand such buffeting, and this plan will be shelved once more pending a return to stronger growth, possibly in 2020, though we are not taking a view on that just yet.